A sweet and savory dish that feels gourmet and is very easy to make. For the Chicken- Preheat oven to 350 degrees. Place chicken breasts in a large baking dish and drizzle with olive oil. Sprinkle thyme, salt & pepper over chicken. Bake for 40 minutes or until reaches internal temperature of 165 degrees. For the Blackberry Balsamic Sauce- Place all ingredients for blackberry balsamic sauce in a med saucepan with the exception of the cornstarch. Bring to a boil over med/high heat stirring often. Let boil for approximately 12 minutes or until blackberries are easy to break apart. The next step is optional. Once blackberries are broken apart fairly well, strain through a fine mesh colander to remove seeds. Place strained Blackberry sauce in original saucepan and add cornstarch. Cook over a med/low heat whisking consistently until sauce thickens- approximately 6-7 minutes. Once thickened, take off of heat. For the Apricot Jeweled Couscous- Measure couscous in a med bowl and set aside. Dice and measure apricots and add to couscous bowl. Bring broth, lemon juice and olive oil to a boil in a med sauce pan. Add couscous and apricots. Cover pan and remove from heat. Let stand until liquid is absorbed, approximately 5 minutes. Fluff and serve. Assembly- Cut chicken breasts in strips and place next to couscous. 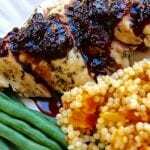 Spoon Blackberry Balsamic Sauce over chicken and couscous. Serve with veggies.